In early August 2012, Mars Curiosity touched down on the Martian surface to cheers heard �round the world. The rover, part of NASA's Mars Science Laboratory mission, safely reached Mars after an eight-months-plus journey and a final seven minutes of terror involving a series of complicated yet precisely executed steps during entry, descent, and landing. Gale Crater was selected as the landing site for Curiosity because of its varied terrain. The crater floor is surrounded by a three-mile high mountain with geologic layers that span many years in the history of Mars. Just as the layers in the wall of the Grand Canyon reveal Earth�s past, the layers on Mars show clay near the bottom, giving insight into Mars's past, topped with layers of sulfur and oxygen-bearing minerals. Flowing water appears to have carved channels into the layered walls. Curiosity will work its way up through these layers. Mars Curiosity has two radiation detectors, named RAD and DAN. RAD stands for Radiation Assessment Detector. RAD's job is to measure high-energy radiation on Mars, whether its source is from space or from the planet�s atmosphere or surface. RAD will give scientists an idea of what kind of radiation dangers future human explorers will face on Mars. DAN is the Dynamic Albedo of Neutrons instrument and searches for water. The cosmic rays from space that bombard Mars knock neutrons out of their atoms. If water is present, these neutrons are slowed down, and DAN can detect the sluggish neutrons. As the spacecraft descended through Mars's atmosphere, the Mars Entry Descent and Landing Imager (MEDLI) collected data that will be crucial in planning future human missions to Mars. MEDLI obtained data that will help future missions be designed for safer and more reliable entries. 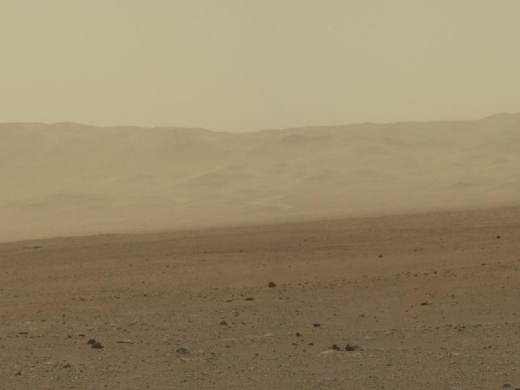 The REMS sensor (Rover Environmental Monitoring Station) is like the weatherman on Mars. This instrument provides scientists with daily measurements and reports on atmospheric conditions such as temperature, wind speed, humidity, pressure, and ultraviolet radiation. Curiosity has three types of cameras: the MastCam, MARDI, and MAHLI. The MastCam takes the colour images and video that have been released showing panoramic views of the rover�s surroundings inside Gale Crater. MARDI took video as the spacecraft descended to the planet, allowing for the movements of the rover to be mapped out over the terrain as seen by MARDI. MAHLI stands for Mars Hand Lens Imager and will provide the close-up views of rock and dust that geologists will need to best examine Martian minerals. The four spectrometers aboard Curiosity are APXS, SAM, ChemCam, and CheMin. APXS stands for Alpha Particle X-Ray Spectrometer. APXS will handle the rock and soil samples to determine the elemental composition in the Martian terrain. This information can help scientists understand how the material was formed and shaped by the elements on Mars. The Sample Analysis at Mars (SAM) instrument directly searches for carbon, a key to finding life in the universe. SAM will use a mass spectrometer, gas chromatograph, and tunable laser spectrometer to aid in its search. Other elements associated with life, including nitrogen, hydrogen, and oxygen, will also be SAM's target. ChemCam will be popular with cartoonists chronicling Curiosity as this instrument fires a laser into the Martian terrain and then analyzes the vaporized remains. The resulting plasma reveals its secrets to an on-board spectrograph, laying bare minerals and microstructures in the rocks. CheMin is the Chemistry and Mineralogy instrument that will distinguish what kinds of minerals are on Mars, such as those that require water and those that don't. This tells scientists what the past environment on the planet was like and whether it was once conducive to water and, therefore, life. The Curiosity team even expects to take night sky pictures from Mars once the mission is fully operational. Days on Mars are called "sols", and one sol lasts for about 24 hours and 40 minutes. The scientists working on the project all adjust their days so that they are on Mars time, which means re-setting their alarm clocks each day. Curiosity�s mission length is 23 months, but like the rovers that came before, the equipment is expected to last much longer and the mission will probably be extended. The hope is that the important scientific findings will be discovered earlier on in that 23-month window. Curiosity is the largest rover ever to explore Mars. In 1997, Sojourner was a rover about the size of a child's wagon that explored the Red Planet. In 2004, twin rovers named Spirit and Opportunity, about the size of a large shopping trolley, were the next to explore Martian terrain. Curiosity is similar in size to a dune buggy and will behave much like one as it traverses the desert-like surface. In this age of social media, you can follow Curiosity's progress on Twitter, because it has its own account: @MarsCuriosity. More than one million twitter users are already getting regular updates from the rover.